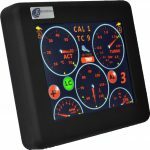 Toucan is an innovative touchscreen display unit that connects, via CAN bus, to Syvecs, Life Racing, AlcaTek, SimTek, Link, Vi-PEC, MoTeC, or MBE engine management systems. It also supports the STACK protocol via RS232 serial data, used by ECUs such as the Pectel T6 etc. Easy naming and selection of Calibrations (or maps), in place of the standard rotary switch. Extensive gauge displays, complete with audible and visible alarms, as well as absolute and dynamic peak markers.